Poor Santa. Year after year he thinks of everyone else but no one thinks of him. He delivers gifts by the sack load to a gazillion billion entitled ingrates, and do they thank him? Hell, no! If someone catches him shimmying down their chimney on Christmas Eve, they punch him in the mouth and have him arrested! 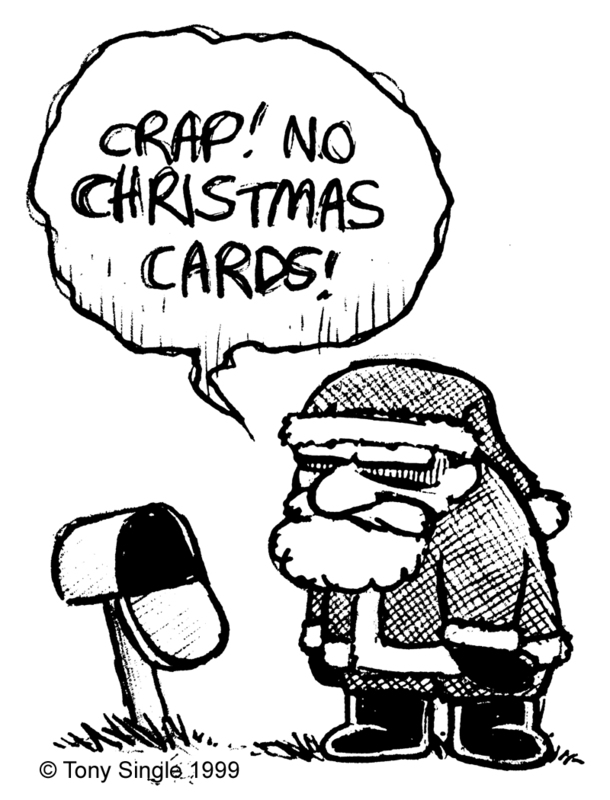 He doesn’t even get given Christmas cards. Not a single one. Only an angry letter from some guy named Tony. No wonder Santa doesn’t feel loved. No wonder he wants to quit being Santa. But it’s okay, Santa, we still love you. There’s always next year. I slowly ascend into the dark still waters of the black lake. I am alone, yet I feel all things around me, and it comforts me. I am announcing myself to the majestic black lake. The water, is cool on my naked body, it relaxes me. I am one with nature, and she with me. I close my eyes, as I hear a faint noise approach, getting louder. Now perched on my Manhood, is the Goliath Birdwing butterfly. She smiles, opens her mouth, bites off my manhood, and flies away into the darkness.